3T MRI is imaging that uses the strongest magnet currently available. The machines cost more money, but they are worth it. They are twice as strong as standard closed MRI scanners and ten times stronger than traditional OPEN MRI scanners. Over the past several years, a new kind of OPEN MRI has been developed (called “Open Bore” MRI). It has more room for patients AND a magnet that is as strong as any 1.5T MRI scanner in the State. Because we have both types of high quality MRI scanners, we can provide a high quality MRI scan for any patient. The fact that we also have IV sedation available at no extra charge for patients who are extremely claustrophobic further expands the number of people able to receive quality imaging. and more quickly than any other scanner. Clearer images. Faster. For brain imaging this is particularly important. We see with greater clarity and generally find up to twice as many lesions as a 1.5T scanner. 3T is known to produce superior images and might actually cost less than an inferior 1.5T scanner (because the study will not need to be repeated). Surprisingly, there are still some doctors who seem are unaware of the benefits of using good MRI scanners. We have an increasing number of referrals from Johns Hopkins and University of Pennsylvania where the doctors insist on 3T quality. in a study supported by the American College of Radiology. (For more info: www.3tbreastmri.com). The strength of 3T also means studies take less time. 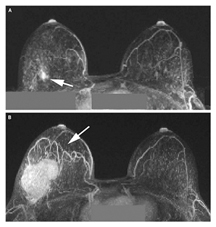 Minimal breast MR imaging times at 3T can be as little as 8 minutes after the localizing images. 3T is not only the most detailed, it is clearly the fastest exam as well. For women who do not fit in traditional closed MRI’s, our OPEN BORE MRI produces excellent images. Not quite as clear as 3T, but a good option for women need an alternative. Most doctors are unaware that our scanner is the widest in the world. 3T MRI is also faster for studies of the chest, abdomen and pelvis. We can get images in under a minute of scanning in all areas of your body which are very diagnostic (“diagnostic” means you can see things clearly enough to make a diagnosis). But we spend 20-30 minutes on your scan to let us see even more detail and use special imaging sequences such as diffusion weighted imaging which all the other providers do not perform because they wish to save time and money. We prefer to provide the most complete study and charge the same or less than the other facilities. almost completely replace CT scans. This is important as CT subjects patients to vast amounts of radiation. Radiation has been linked to several forms of cancer. There was a recent finding by the FDA that some scanners inexplicably deliver up to 20 times the ordinary dose of x-rays. In these patients in California, the radiation dose was so high that the patients actually lost hair and might get early cataracts from a CTA (computerized axial tomography angiogram and perfusion study.) Most people are unaware of the huge dose of radiation that each CT scan delivers. Be aware. Always ask if there is a different test available that will not expose you needlessly to radiation. CONTRAST is an issue of growing concern. Adding contrast to the MRI can change the diagnosis as much as 25% of the time. Just this past week several abnormalities were ONLY seen after using contrast. BUT, there are several different kinds of contrast approved for use with MRI. And, not all contrasts were created equal. Some have been linked to a rare, debilitating illness. (www.safecontrast.com) Sadly, the two contrasts that have never been linked to this disease (“NSF”) cost just a few dollars more per dose and there are some MRI Providers who do not stock it for this reason. Ask your MRI Provider which contrast they use! Lastly, I also want to mention we are happy to review your older studies. If you have older images—please bring them so they can be compared at no charge of course. even our “open” MRI is an 18-channel 1.5T MRI scanner! (Ask your MRI provider how many channels their closed magnet has). Because of its extraordinary sensitivity to Breast Cancer, we prefer to do our Breast MRI’s on our 3T MRI, but for someone who either will not fit, or who is extremely claustrophobic, our 18-channel 1.5T OPEN BORE MRI is a good alternative. Getting a bad MRI usually costs more than getting the very Best MRI possible … except for the time it will take you to repeat an inferior study. Ask questions. Get the best. More information can be found at www.mriconsultants.net and www.bestopenmri.net, or give us a call at 302-838-7800.